Most gardeners will not forget their first vision of a mandevilla vine. The plants bloom from spring to fall with brightly colored cupped flowers. Mandevillas are in the Periwinkle family of tropical to sub-tropical flowering vines and bushes. They are hardy in USDA plant hardiness zones 9 to 11, but you can overwinter them in cooler climes. Feeding mandevillas nourishes the growth and bloom flushes. 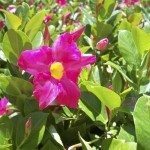 The correct food and knowledge on how to fertilize a mandevilla will have you on the road to a glorious season long producer, with plenty of potential for consistent annual growth. 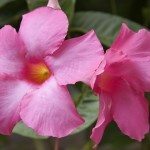 Apply mandevilla fertilizer in spring and summer every two weeks. The vine will go dormant in winter, so don’t feed then or you may have a flush of tender new growth that will be harmed by cooler weather. Start in March in warmer zones and begin to increase watering. Plants that have been brought indoors should first be introduced to brighter light and acclimated gradually to the outdoors after all danger of frost has passed. Start feeding these potted versions in May. Use a mandevilla fertilizer on young plants that have a slightly higher nitrogen ratio to promote leafy growth. Feed for two weeks and then graduate to a balanced food that will promote buds and blooms. The plants respond well to a diluted food added to their irrigation water every two weeks. Potted plants, especially, require a liquid application followed by a good watering to get the food to the roots and prevent root burn. A granulated time-release fertilizer for mandevilla plants works on in ground vines. It can be applied just once every month as the time-release formula gently discharges the food to the root system over a longer period. Suspend fertilizing a mandevilla in fall and throughout winter to avoid excess sensitive leaf growth and unsupported buds. Feeding mandevillas a balanced plant food provides basic nutritive input. A good 20-20-20 ratio food is useful for many types of plants as well as for fertilizing mandevilla. Choose an organic formula as part of a sustainable and clean landscape. For more blooms, you can apply a high phosphorus food every two to three weeks early in the flowering season. Phosphorus enhances plants ability to flower and promotes buds. You can tell if you have a high phosphorus count by looking at the middle number in the formula. You can also get a “bloom buster” food, but often these have levels of phosphorus that can be too high and toxically damaging to your plant. Change back to the balanced food half way through the summer.